There's a hint of the complexity of identity in the Arab and Islamic world with the seemingly incidental detail that 8 of the 27 victims of the bomb attack on a Shiite mosque in Kuwait City were flown to Najaf, Iraq, for burial. These identities move across national boundaries, especially at times of crisis. It's part of what makes analyzing the region in terms of the role of states so difficult. I welcome the statements of the Eurogroup and the European Central Bank to make full use of all available instruments to preserve the integrity and stability of the euro area. Euro area Member States intend to make full use of all the instruments available to preserve the integrity and stability of the euro area. But: that's not a Eurogroup statement. It's a statement issued by ministers of finance from the 18 EU countries that use the Euro, excluding Greece. Indeed, the statement is titled as a "ministerial" statement, in tacit recognition of the irregular status of that meeting. There's understandable focus in the news today on what look like ISIS-inspired attacks in France, Tunisia, and Kuwait. But the death toll from those combined attacks is swamped by the toll from a single ISIS attack on the previously "liberated" Syrian Kurdish town of Kobani (145 dead). The scale of the assault appears partly due to the Kurdish militias having become overstretched during a successful southward assault towards Raqqa. Among the bizarre things about the current "debate" over what to do about ISIS is that direct ground intervention against them, or their symbiotic Assad regime counterparts, is off the table. Meanwhile, communities and countries that already have a lot on their plates are left to grieve and cope with the consequences. Photo: a grieving Kurdish family on the Turkish side of the border. REUTERS/Murad Sezer. Both of the Constitution’s Due Process Clauses reach back to Magna Carta. What then follows is the preposterous logic of "strict constructionism" on full display: constitutional articles have to be interpreted in their intended meaning at the time, and at the time what they really meant was based on what somebody in England wrote, in 1215. He's oblivious to the role that he, and four other judges, played in selecting George W. Bush as US president in 2000, and the enormous consequences for Americans -- and Iraqis! -- that flowed from that. IMF Managing Director Christine Lagarde with several key Eurozone finance ministers but especially Ireland's Michael Noonan. Photo: European Council photo service. Mr Yanis Varoufakis, Greek Minister for Finance, seemingly proudly holding up what looks to be an entirely red font and mostly strikethrough version of whatever economic plan Greece is proposing to the Eurozone finance ministers. UPDATE: The document appears to be an evolved version of an earlier leak and it's worth reading the overall take of former IMF staffer Peter Doyle. The Court predicts that making tax credits unavailable in States that do not set up their own Exchanges would cause disastrous economic consequences there. If that is so, however, wouldn’t one expect States to react by setting up their own Exchanges? Because of course American history is full of example of the states taking quick action to rectify problems affecting people, especially low income people, in their territory! The White House has looked at current US policy regarding hostages and has seen what everyone else sees, which is dead hostages. And there'll also be grant program to fund NGO support to hostage families. With a real push, all that could be in place at about the time the training of Syrian rebels actually happens! It's as realistic that Liam Neeson's Bryan Mills has a real-life solution to hostage situations as this new plan. Speaking just now in the US House of Representatives, Louie Gohmert, Republican from Texas, has compared the injustice of the murders in Charleston South Carolina to the way Israel is treated in a UN report. Source: Congressional Record, House, 23 June, H4588. This protracted dispute will result in desirable carnage if Greece defaults, thereby becoming a constructively frightening example to all democracies doling out unsustainable, growth-suppressing entitlements. IMF Managing Director Christine Lagarde, inexplicably invited to a Eurozone finance ministers meeting about Greece despite the IMF having walked out of the talks with Greece, shakes hands with the Greek Minister of Finance Yanis Varoufakis. Technically, Mme Lagarde was there to brief the ministers on the vacuous findings of their Eurozone assessment, which blithely assures that Greece is not a problem, with enough CYA language in case it is. She then told the post-meeting news conference that "the key emergency in my view is to restore the dialogue with adults in the room" -- a classic exposition of the SuperTechnocrat view of the world that has gotten us to this point. Better to look to the embattled region itself—to Jordan’s King Hussein, to Israel’s Prime Minister Benjamin Netanyahu, to the leaders of formative Kurdistan, to the crown prince of Abu Dhabi, Mohammad bin Zayed Al Nahyan, and to Egypt’s President Abdel Fattah Al Sisi. Elsewhere in the article, he refers to Ronald Reagan. He's stuck in those years in his knowledge of Jordan too. King Hussein died in 1999. His son, Abdullah, is the current King of Jordan. Legal Department in the Ministry of Planning announced the conditions of contract for civic, electric and mechanic engineering, written pledge has to be signed by the contracted side with, that it don’t deal with Zionist entity [Israel], institution and companies. It will not deal with them in the present and future, and consider them as an integral condition for the contract. Contract will be terminated in case of violation with paying the appropriate compensation to the side of contract, as well as it will be subjected to the legal consequences. Equally important will be the reaffirmation and articulation in more specific terms of our partners’ willingness to provide debt relief, as initially stated at the Eurogroup meeting of 27 November 2012. It's worth reading that statement in full, since it has been frequently misinterpreted. In particular, certain econo-pundits have focused on the 4.5% primary budget surplus target as proof of austerity madness, when the same statement clearly indicated there would be massive debt relief in the medium-term. It's the failure to achieve consensus on that latter part of the plan which has aggravated the situation. But parallel to the talks [Israel-US discussions about Iran] came administration statements and leaks—for example, each time Israeli warplanes reportedly struck Hezbollah-bound arms convoys in Syria—intended to deter Israel from striking Iran pre-emptively. So part of Israel's calculation in its strikes against Bashar al-Assad had to be whether the White House might disclose them in order to put a little heat on Israel about its ability to strike across borders. It's almost as if the White House wasn't that keen on any military action against Assad! UPDATE: It turns out that Oren's article draws from his forthcoming book in which the above is not the only scoop. Another being that the idea of offering Assad a joint Russia-USA chemical weapons disarmament plan came from an Israeli minister. 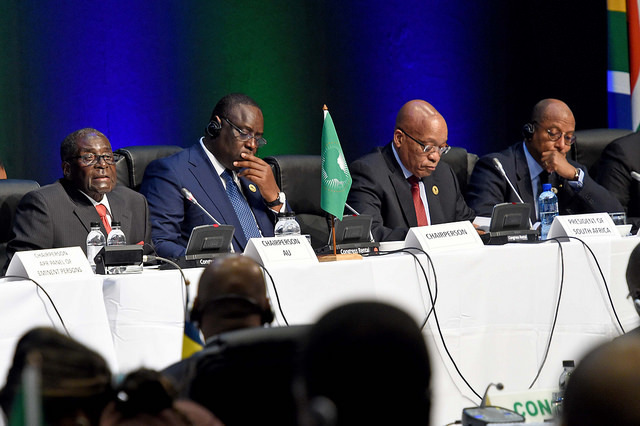 The focus of the legal imbroglio at the African Union summit in South Africa is on Sudan President Omar al-Bashir. But Zimbabwe's Robert Mugabe, with at least one violence-tainted stolen election in his past, is there too, as Chairman of the African Union. In fairness to Mugabe, who knows what buttons to push, he has pointed out the role of Iraq 2003 in undermining the legitimacy of the ICC indictment of Omar al-Bashir. That doesn't make Darfur any less of a war crime. Rapid completion of the debt operation with high participation is vital for the success of the program, since Ukraine lacks the resources under the program to fully service its debts on the original terms. The IMF, in general, encourages voluntary pre-emptive agreements in debt restructurings, but in the event that a negotiated settlement with private creditors is not reached and the country determines that it cannot service its debt, the Fund can lend to Ukraine consistent with its Lending-into-Arrears Policy. 1. It's revealing to note how the IMF behaves in insisting on debt restructuring when it's not saddled to the European Union institutions as in Eurozone programs. 2. Are there other entities, such as those around the table on Greece, who need to take note that the IMF might find ways to lend to a country that owes them money? Sample usage: A trade deal with a mainly Globobo support base has a very narrow political base. Just so long as that frog doesn't hop into Bashar al-Assad territory in Syria! Another uncool strongman narrative comes crashing down. so, you're not actually why they're interested! French President Francois Hollande doing the most credible job among the G7 leaders of holding his glass of beer. 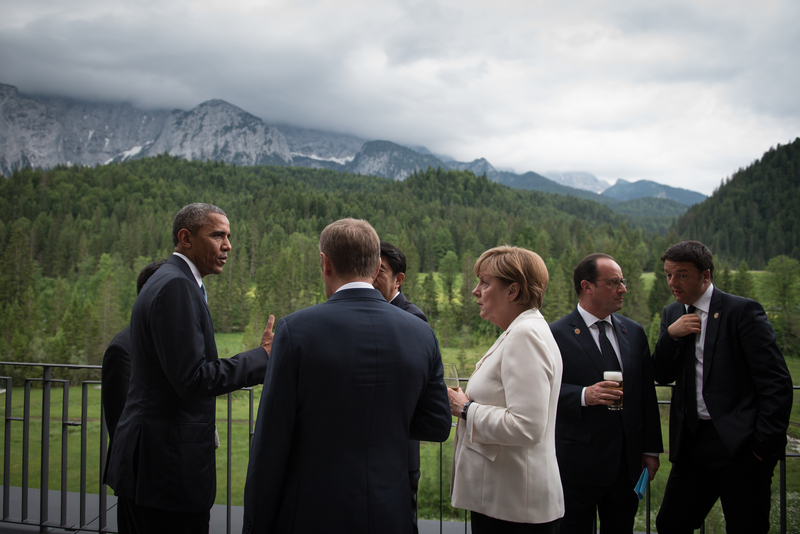 Photo: Germany G7 Media Service. The Irish Independent can reveal that the football association came to an agreement on the write-down of its Aviva Stadium loan at lunchtime yesterday, after almost six months of negotiations with Danske Bank. A source close to the talks said the successful renegotiation of the FAI's loans, which now stand at €43m, leaves the association "in a very good position to achieve the objective of being debt free by 2020". "This was a phenomenal bit of business when you think about it, almost a quarter of debt reduced following months of intensive negotiations," said the source. Leave aside the fact that the Indo's "source" sounds a lot like John Delaney. Did Danske Bank shareholders -- who were ultimately on the hook for that debt write-down -- know that the operator of the troubled project had signed away the right to sue over a big loss in income due to the World Cup elimination? Or that if Ireland had somehow qualified for the 2014 World Cup, its borrower had to find another €5 million to pay FIFA back? FIFA's hush money compounded what was already an awful set of divergent incentives between the FAI and its creditors -- on a project with considerable public funding. This one might merit a look by one of Ireland's skilled lawyers! With the "news" (which was reported 7 days ago) that Greece is bundling its June payments to the IMF, the reports can't resist pointing out that the last country to bundle was Zaire (Democratic Republic of the Congo). But before having too much of a chuckle at that comparison, consider some analyses of Zaire's difficulties written long before there was a Eurozone crisis. From 1976 to 1981, the IMF increased Zaire's debt burden, lending $52 million (coupled with $235 million from the Paris Club) in exchange for a series of 1978 "reforms." Zaire placed IMF and other foreign officials in key positions in the central bank, finance ministry and office of debt management. "Belgium is sending 30 to 40 customs inspectors to stop bribery and smuggling," U.S. News and World Report said in 1979. "Europeans run the vital river-transport system. France is considering sending tax experts, and a United Nations team is moving in to make some order out of the budget." A country being loaded up on IMF debt and European experts being sent to run things. Hmmm. From 1977 to 1987, Zaire rescheduled its debt eight times. Although Zaire only drew down $3 billion worth of new loans during that decade, its debt increased to $7 billion from $2 billion. The $2 billion difference largely went for rescheduling fees, capitalization of interest and late-payment penalties. Debt going up with the country actually getting new funds? Hmmm again. Now of course, Zaire had one huge problem: its western-backed dictator, Mobutu. But Mobutu was himself part of a vicious cycle caused by official debt accumulation that brought little benefits to the citizens. One would hope that with that benefit of history, we could see the limited value of stringing a country along on debt with fanciful prospects of repayment. That Zaire-Greece comparison may be worth a few chuckles. But the joke is on the residents of the Global Debt Ward. The outcome of Iraq's civil war left just enough ISIS operatives in position to move into Syria during the early stages of the Syrian civil war in 2012. ISIS's move into Syria was a disaster: it radicalized the Syrian civil war, strengthening jihadis at the expense of more moderate rebel factions, while also providing ISIS with the experience and resources necessary to take territory and move back into Iraq in a big way. Missing there is the conscious decision of Bashar al-Assad to concentrate his military on the most moderate elements of the opposition and let the extreme groups including ISIS flourish in de facto safe havens. And from the overall perspective of the Syrian opposition, it was telling that the first US intervention was not against Assad, but against a rebel group.